Inventory We are a resale marketplace, not a box office or venue. Ticket prices may exceed face value. This site is not owned by The Dome at America's Center . 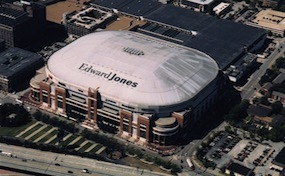 The Dome at America's Center, formerly the Edward Jones Dome, opened in 1995 as the home to the National Football League's St. Louis Rams. The venue was built, primarily to lure an NFL team back to St Louis, at a total construction cost of $280 million. The Dome at America\'s Center box office is located at 701 Convention Plaza in downtown St. Louis, Missouri. The official seating capacity is listed at 66,965. Outside of NFL games "The Ed" has hosted events like 2005 NCAA Men's Final Four, multiple NCAA regional brackets, the Big 12 football Championship, and the yearly University of Illinois versus University of Missouri college football game. The Dome at America\'s Center tickets have been a hot item since the 2009 renovation that included all new LED video displays. Eventhough the Rams are now gone it doesnt mean the the Dome has stayed vacant. With Monster Jam, Supercross and many performers lining up like Beyonce and Guns n' Roses the dome is going strong. DomeStLouis.com is not affiliated with any official website, venue, supplier, or primary box office. We are a privately held company that specializes in online sales of all events in the secondary market. Ticket prices may fluctuate at anytime below or above face value. To place an order for all The Dome at America\'s Center St. Louis events please follow the steps online or call our operators at anytime.